5 years ago, I published some statistics on the countries that visit the Knoco website, as a proxy for their interest in KM. Let's revisit those statistics 5 years later. It's very difficult to find any clear metric we can use to measure KM maturity, or KM interest. I published here some results from the Knoco KM Survey showing regional levels of KM maturity, and 5 years ago used the source of visitors to the Knoco website as a proxy for country levels of KM interest. Certainly we try to make the website a reference set for the visitor, with free reference material, videos, newsletters and white papers, and would hope to generate visitors from any country where KM is active. 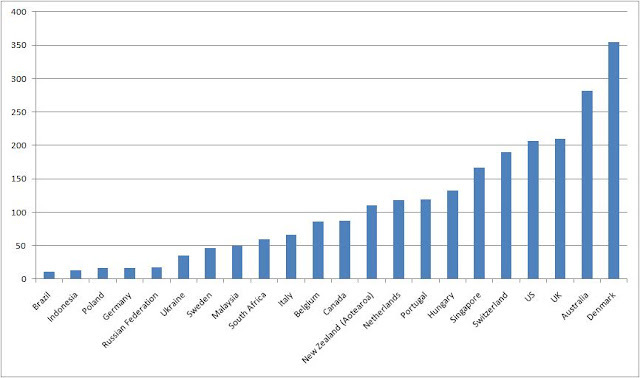 The graph below shows the number of visits to the website from each country prior to March 2011, divided by the country population in millions. I did the same again this week, using Google Analytics as a source of visitor data over the past year, and normalising by population again into "visits per million". The plot below shows the difference between the two figures for each country. 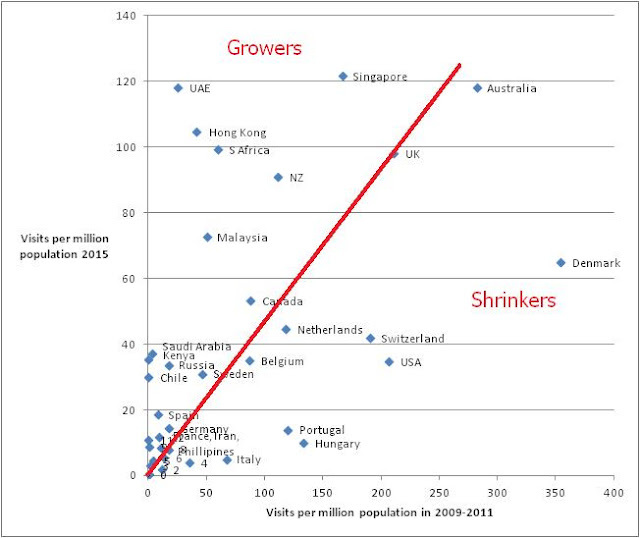 Using the UK as an arbitrary reference, we can divide countries into Growers, where the visits to the Knoco website per million population have grown over the past 5 years, the shrinkers, where visits have decreased, and those which have remained fairly static. I have not bothered to label all the points in the cluster around the chart origin. Growers include the UAE, Singapore, Hong Kong, S Africa, NZ, Malaysia, Saudi Arabia, Kenya, Russia, Chile, Spain and Iran. The number of visits to the Knoco website is not an ideal metric for KM interest or KM maturity! The website is in English, so visits from English-speaking countries are over-represented. The website is not static - we are constantly changing it. The range of alternative websites changes, as old sites close and new sites are created. However it is a metric, and few other metrics are available. And some of the changes in visitor patterns are large enough to be evidence of global shifts. There are some clear drivers behind some of the growers; the deliberate move towards a knowledge economy in Singapore and Hong Kong, the municipal focus on KM in the UAE, the inclusion of KM in the National Qualification Framework, to name but a few. So there may well be shifts in emphasis on KM, which we can see within this dataset. If you have other similar data you can share, I would be very interested to see it, and to see whether these shifts and trends can be confirmed.